Compare instant coffee from International Roast, Moccona, Robert Timms, ALDI AlCafe, Nescafe, Nestle, Woolworths and Coles, on taste, texture, aroma, value for money, packaging, variety and overall satisfaction. International Roast has ‘roasted the competition’ to lead Canstar Blue’s consumer ratings for instant coffee. It earned five-star reviews on taste, texture, aroma and overall satisfaction. It was four stars on value for money and packaging as well as three stars on variety. Not everyone is a morning person, so when you need a coffee, you need it fast. While some can make it to their local café before work, others struggle to get out of the door without their coffee fix. So, this is where instant coffee steps in – boil a kettle and get a mug. But with a long supermarket aisle to search through, we’ve narrowed down the list to help you find who has the right blend of value and taste. Is it worth spending more on the big-name brands? Or can supermarket labels tick all the boxes? 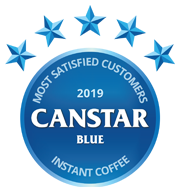 To find out, Canstar Blue surveyed more than 1,200 coffee-lovers across Australia to get their thoughts on the instant coffee they’ve most recently purchased. Brands went head-to-head on a range of factors including taste, texture and aroma. Eight leading brands made it to our inaugural instant coffee review, with the results reflected in the table above. But only one brand earned five stars for overall satisfaction – International Roast. It rated five stars on taste, texture, aroma, and overall satisfaction. It also got four stars on value for money and packaging as well as three stars on variety. Moccona, Robert Timms, ALDI AlCafe, Nescafe and Nestle all got four stars for overall satisfaction, while supermarket branded instant coffee from Woolworths and Coles was left on three stars apiece. Notably Moccona was the only brand to get five stars on variety. It also achieved five stars on taste, alongside International Roast. Both ALDI AlCafe and Robert Timms got five stars on packaging. In addition, ALDI AlCafe was the only brand to get five stars on value for money. Our survey also revealed that more than half (53%) of consumers have to have a coffee in the morning to help start their day. Three in five (63%) generally buy the same brand and 30% go out of their way to buy the coffee they like. A third (35%) make it at home to prevent spending money in a café, while 17% prefer home brewed coffee over a barista made. 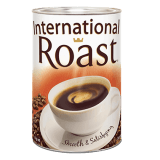 International Roast instant coffee is boasted to be made in Australia from 100% natural coffee beans. Its range is stated to have a blend of quality coffee beans to deliver a mild tasting coffee with a smooth, well rounded flavour. It’s claimed to have no additives or preservatives. International Roast also offers its Caterer’s Blend, packed to meet the needs of caterers seeking quality and great value, according to the brand. Sizes available include 200g, 500g and 1kg cans. Canstar Blue surveyed 3,000 Australian adults across a range of categories to measure and track customer satisfaction, via ISO 26362 accredited research panels managed by Qualtrics. The outcomes reported are the results from customers within the survey group who have purchased instant coffee to brew at home in the last 3 months – in this case, 1,256 people.